An Bonn Jadotville is inscribed with “cosaint chalma” and “misneach” – the Irish words for ‘valiant defence’ and ‘courage’. SOLDIERS OF THE Siege of Jadotville and the families of deceased members of the infantry were today presented with medals honouring their bravery and courage. The siege of Jadotville was an event that occurred during Ireland’s peacekeeping mission in the Congo in September 1961. The 158 Irish soldiers found themselves fighting against 5,000 of Kantanganese troops to survive, as their supplies of ammunition, food and water dwindled over the course of 5 days. Today, Minister of State for Defence Paul Kehoe presented An Bonn Jadotville to members of the ‘A Company’, who took part in the Siege of Jadotville in September 1961. Speaking at the ceremony, the minister told the soldiers and family members who had gathered at the medal ceremony in Athlone, “the retelling of the events at Jadotville does not and cannot reflect the incredible reality of what happened during the siege and its aftermath. It can only briefly suggest the courage you showed in your willingness to act and the bravery displayed in your every actions. Despite the overwhelming numbers opposing them, the men of A Company retained their resolve and remained unshaken during the attack. Minister Kehoe and former Taoiseach Enda Kenny decided to award a medal to the men of ‘A Company’ on 13 June 2016. The word ‘Jadotville’ is depicted on the clasp of the medal and the medal ribbon represents a combination of an Irish tricolour and the United Nations Operation in Congo mission medal. Speaking in relation to the medal design, Kehoe said, “I would like to draw your attention to the words on the medal that you will soon receive. The words state ‘cosaint chalma’ (which means “valiant defence”) and ‘misneach’ (which means ‘courage’). These words were carefully chosen in order to pay tribute to the courageous actions of the men of A Company. 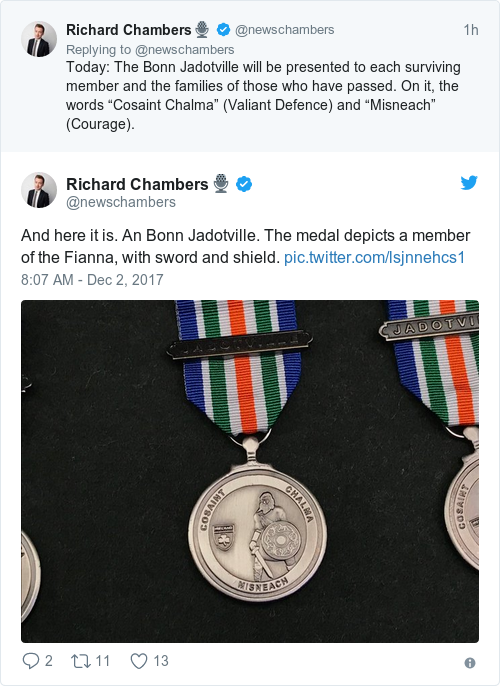 Email “After 55 years, Irish soldiers awarded medals for Siege of Jadotville”. Feedback on “After 55 years, Irish soldiers awarded medals for Siege of Jadotville”.